Well that was interesting. Just about the time that folks started calling for the top in the "Trump Rally," stocks exploded higher, leaving many scratching their heads as to why. In fact, a topic of conversation on my afternoon calls yesterday was the question of why the Dow was suddenly up 300 points. "What headline did I miss," was the question I got asked a few times. However, there weren't any headlines. No new Trump tweets. No big company news. Nothing. And that is what makes yesterday's joyride to the upside interesting. To be sure, traders in the U.S. tend to take their cues from Europe when things are moving - especially in the early hours of a trading session. So, after a quick dip at the open here in the U.S. it wasn't terribly surprising to traders hop on the back of what turned out to be a pretty decent day across the pond. However, with an ECB meeting on tap, it was curious to see stocks move up strongly in front of the meeting. And given that "Super Mario" announced this morning that the ECB is going to extend its QE program through December 2017 - albeit at a tapered rate starting in April (60 billion euros a month vs the current pace of 80 billion per month) - one has to wonder if the news had been somehow leaked. And given the way rumors spread on Wall Street, this is a decent theory to explain at least part of yesterday's surge in the stock market. Furthering the theory that somebody knew something (or at least thought they knew something) were the reports of a very large buy program coming into the market around lunchtime yesterday. If you look at the price action on a one-minute chart, the rally did seem to get legs around 1:00pm eastern time - and then never looked back. And a solid understanding of how the millisecond trend-following game works help "esplain" the relentless move higher during the afternoon. 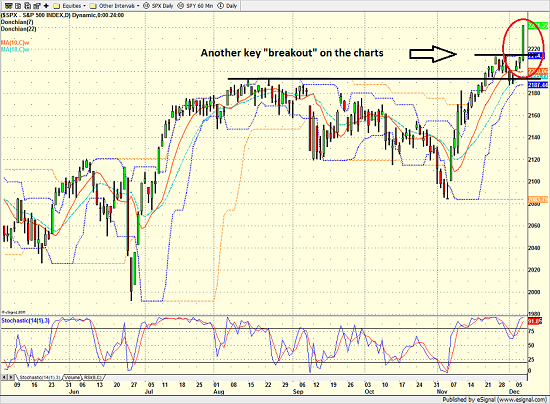 Another argument for the rush to buy yesterday was the "breakout" on the chart of the S&P 500. After a three-week bounce in response to the election, stocks pulled back a bit after Thanksgiving. This led many to begin "calling" for the end of the so-called "Trump Rally." The S&P wound up waffling lower for about a week before attempting to return to rally mode. As of yesterday's open, it appeared that the venerable blue-chip index might be bumping its head on the previous high, which oftentimes represents a resistance zone. And given that traders have been playing the trading range game (buy the low end of the range and sell the top end of the range) for years now, one couldn't be blamed for thinking that the bears might be ready to make a move. So, when stocks broke above the old high, traders and their computers took notice. Shorts covered. The fast-money types bought. The computers chased their tails. And before you could finish lunch, the bulls were on the move. Market historians love to focus on the so-called Dow Theory, which suggests (and I'm generalizing here) that when the Dow Jones Transportation Index and the Industrial Index are both hitting new highs, you've got a bull market on your hands. So, with the Transports moving to their first new high since late 2014 yesterday, old-school analysts starting talking up the Dow Theory and the implication that a new bull market had been confirmed (which is something I've been yammering on about for more than six months now). Yet another theory for the spike in stocks yesterday centered on the theme of year-end positioning. With the bulls on the move and the number of trading days left on the 2016 calendar dwindling, the thinking is that any money manager who is "light" in terms of their equity exposure needs to make a change here. The idea is that managers won't want their exposure on client year-end statements to be out of whack with what is happening in the market. In other words, managers want to "look like" they are onboard the bull train when clients review their accounts in January. Yes, this is a silly concept, but it is also very real. In addition, there continues to be talk about the "great rotation" trade, where investors purportedly rotate out of bonds and into stocks. While there is little proof that this is actually happening (we'll need to review the quarterly fund flow data next year in order to see if this trade is starting to occur) and bond yields fell yesterday, this remains a go-to excuse for why stocks rally at times. By now, everybody on the planet knows about the "Trump Trades." In short, investors have concluded that a Trump administration is going to be good for business and the economy - and investors of all shapes and sizes are now embracing the idea. More specifically, the hoped-for tax cuts, regulatory rollbacks, and fiscal stimulus that are expected to come out of the new Republican leadership in Washington is causing investors to reposition their holdings. 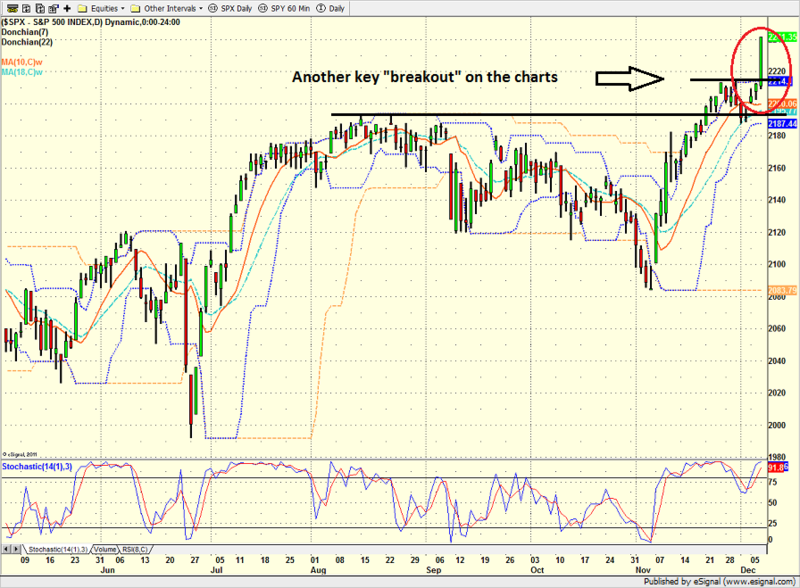 And the bottom line is that this move appears to have continued on Wednesday. And finally, there is FOMO - the Fear of Missing Out. With the S&P 500 now sporting a gain of 9.66% on the year and the gain on the total return index (which includes the reinvestment of dividends) now approaching 12%, a great many investors are starting to fear that they are missing out on something big. So, what do folks do when the market makes their collar start to feel a bit too tight? They make emotional decisions, that's what. And should the current romp higher continue, I'll blame FOMO for at least a portion of the move. Publishing Note: With Sowell Management growing like a weed in monsoon season (the firm is now for more than $1 billion of client assets) and the demands of my team increasing correspondingly, I've decided to make an adjustment to my publishing schedule. So, going forward, my oftentimes meandering morning market missive will be published Monday through Thursday - except when I'm traveling or something big is happening in the markets, of course! It is my sincere hope that our "Daily State of the Markets" continues to be helpful to both investors and financial advisors alike.